Work In-Progress To be completed Spring 2019. 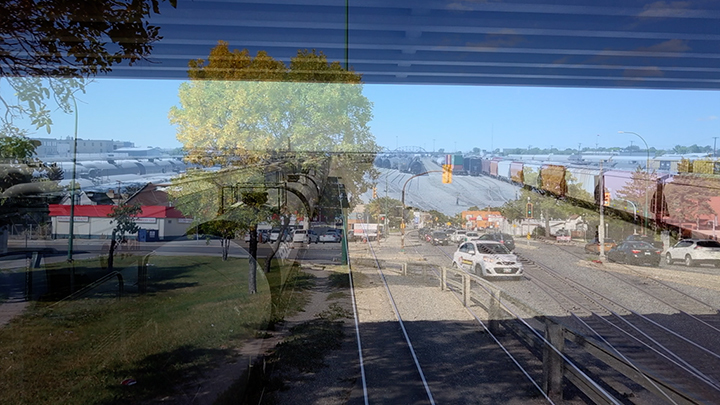 Bridge Meditations is a photographic series and video triptych inspired by personal journeys across the Arlington Bridge, Slaw Rebchuck bridge and Louise bridge, while I was living in Winnipeg's North End. Bridge Meditations moves to open up a conversation about the journey, bridges as safe space/sacred space and flight patterns. This work explores walking and singing to honor those who were here on this land before me and to learn the stories/ songs of this land Treaty 1. I am curious about traditional movement across and along the river, as well as my movement as a guest living on Treaty 1 Territory. This work is also about challenging the bridge as a Western European structure and investigating these three bridges as sites of personal transformation and decolonization through daily movement. The video tryptych was made with singer and drum carrier Dawn Levand and drone videographer Peatr Thomas. Installation at Wood Land School, Plug In Institute for Contemporary Art, Winnipeg, MB 2016. Thunderbird Woman, 1973, serigraph on paper. Collection of the Winnipeg Art Gallery. During 2016, I participated in Wood Land School Residency at Plug in ICA, facilitated by Jaimie Issac and Duane Linklater. The theme, Daphne Odjig's Thunderbird Woman, was influential to this work. When I look at Daphne Odjig’s Thunderbird Woman, I see her shifting between two bodies; two worlds; two perspectives, while at the same time Thunderbird Woman is cohesive and strong. I am prompted to ask: how do Indigenous and settler paths intertwine and crossover when there are different value systems, politics and relationships with the land?